I had the pleasure of playing the adventure game Toren, a mix of Exploration and puzzles. in Toren you guide the Moonchild from being a baby to adulthood in different trials by climbing Toren, which means tower and fighting a dragon that has the power to turn to stone. Where the game stands out is in it’s Visual style and the poetic flow of how it tells its story. Whats your Full Name and Title? My name is Vitor Leães and I’m the Producer of Toren. First of all, how did Swordtales studio came to be? We met in a post-graduation game development program in our city, called Porto Alegre, five years ago. We started to make Toren as the final project for our masters degrees. We had no experience in game development at the time; the whole team came from other fields such as advertising, graphic design and software development. 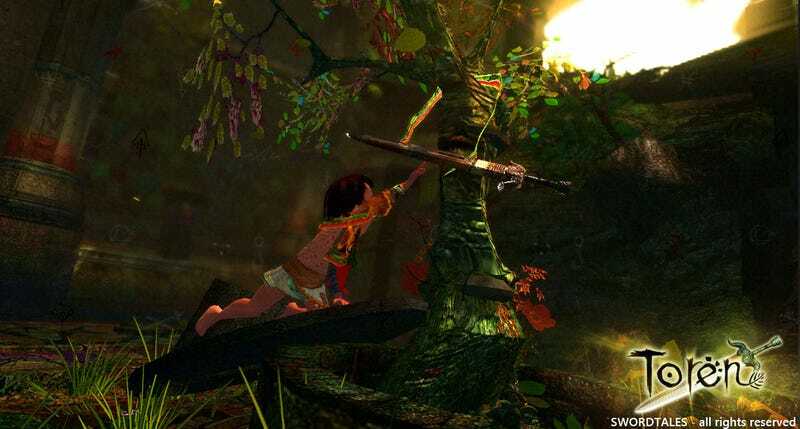 The idea for the game came from a simple concept about a girl climbing a tree. What was the main source of inspiration for Toren? Our main inspiration was from team ICO. We wanted to make a nostalgic game that evokes the same feelings we had playing those Japanese adventure games on the PS1 and PS2. Also, we have a lot of admiration for the introspective games from That Game Company and Tale of Tales. I was in love with the visuals from the start, how was the development process and how did you decide on the look and feel for the game? Our Creative Director, Alessandro Martinello, is a very talented guy and he is a huge fan of Japanese adventures and RPGs. Out of all these references he was able to create something unique. At the very beginning of the project, the colors were very hot and vivid, but we wanted to create a dark fantasy game, an atmosphere that gives to the player a feeling of loneliness and weirdness of this dying world. As you keep climbing the tower, you’ll notice that colors become darker. Also, we have these dream-like levels, in these levels we can transport the player into surreal scenarios and this gives us more freedom to make the game more interesting, because the tower itself is a claustrophobic environment. I know the game is based on various sources like the tower of babel, Kaballah and other sources, how did you decide to bring so many different believes into one? Toren is a mixture of many mythologies, symbolism from different religions, and occult sciences (called Kabbalah, which is referenced a lot in the game). From pop culture, Alan Moore’s comics inspired us a lot. I think this is a strong characteristic of the Brazilian people: the syncretism, the ability of blending different religions, cultures, myths, rites and superstitions. The poetic sense of the game is very appealing, is the text in game an existing poem or did you made it yourself? If so, how difficult was it to create it? The poems are all original. We created the outline of the game, making a lot of references to the ancient Kabbalah texts and Mesopotamian mythology. Alessandro likes this subject a lot and he created the background story of the game mixing those tales and myths. My major focus was to organize the ideas in a narrative structure with beginning, middle and end. The dream levels show a lot of the background story of this bizarre world to the players who pay attention. All the poems and tales were created by our screenwriter, Rodrigo Aragão. The narrative style isn’t easy to follow and this is intentional. The gameplay of Toren is easy but the major challenge to the player is to create their own interpretation of the story.